We provide a full range of state-of-the-art oral appliances, all of which are proven to help in the reduction of both sleep apnea and snoring. With dhealth Dentistry looking after you, you can rest assured that a good night’s sleep is just around the corner for you and your partner. Sleep apnea is quite a serious sleeping disorder, particularly given that people who suffer from the disorder repeatedly stop breathing throughout the night. Breathing pauses can last anywhere from a few seconds to minutes, sometimes occurring 30 times or more each hour. Much more common, this type of sleep apnea occurs when your tongue and other soft tissue in your mouth collapse and are sucked up against the back of your throat, effectively blocking your airway. Approximately 70% of people who regularly snore have obstructive sleep apnea. Generally, the snoring will maintain its momentum at a regular pace, before becoming louder, and then suddenly falling silent for a long period of time, during which breathing does not take place. This silence is then interrupted by a loud gasp, and the snoring recommences. Here at dhealth Dentistry, we specialise in oral appliances for the treatment of sleep apnea. Our remedies prevent the soft tissue at the back of your throat and tongue from collapsing into your airway. An oral appliance does this by shifting the lower part of your jaw forwards, bringing your tongue along with it. This leaves the airway at the back of your throat completely clear. The most comfortable and effective oral solutions is one that is custom made for your mouth. So, we take a model or impression of your mouth and teeth, from which to create your oral appliance. In addition, our oral appliances are made to be adjustable so that we can slowly bring your jaw forward, ensuring your comfort at all times. The end result: a perfect, comfortable fit, for a great night’s sleep. 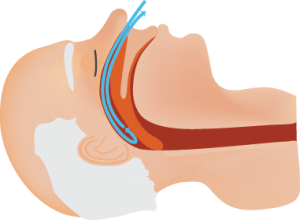 Why Opt for Sleep Apnea Solutions? If left untreated, sleep apnea can result in a wide variety of health issues, including stroke, diabetes, high blood pressure, heart failure, depression, and headaches. Sleep apnea can cause poor performance in everyday activities (like school and work) because of interrupted and poor sleep patterns. You (and your partner) can finally have a good night’s sleep, uninterrupted by snoring, and wake up feeling refreshed.